KABUL (AP) — President Barack Obama made a surprise visit to Afghanistan on Sunday for a firsthand look at the 8-year-old war he inherited and dramatically escalated. After an overnight flight from Washington, the president landed in Afghanistan for a stay of just a few hours, all in darkness. He flew by helicopter from Bagram Air Field to the capital, where he was meeting with Afghan President Hamid Karzai and with his Cabinet, at the presidential palace. It was Obama's second stop in a war zone as commander in chief, coming about a year after a similarly secretive trip to Iraq. 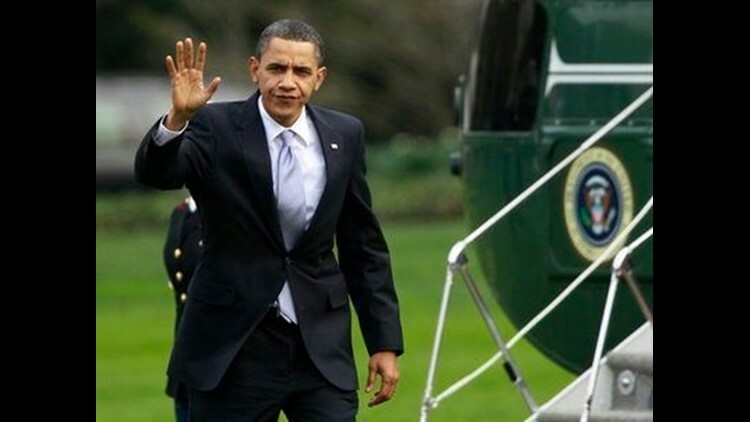 Karzai was notified about Obama's visit just an hour before he arrived, the White House said. This trip, its secrecy forced by security concerns, was an extraordinary capstone to a momentous week in Obama's presidency. He achieved the most ambitious domestic policy initiative in decades with a historic health care overhaul and scored first major foreign policy achievement with a significant new arms control treaty with Russia. In December, Obama ordered 30,000 additional forces into the fight against an entrenched Taliban insurgency that seeks to retake the control of Afghanistan that the militant group lost when the U.S. invaded in 2001. Those new U.S. troops are still arriving and most are expected to be in place by summer, for a full force of roughly 100,000 U.S. troops. There were about 34,000 when Obama took office. The White House made no advance announcement of the visit, which officials said had been long desired by the president but delayed by weather and other logistical obstacles. Obama had gone Friday afternoon to the presidential retreat at Camp David, Md., from which unnoticed departures are easier because of its secluded mountain location. The small contingent of White House aides and media allowed on the trip were sworn to secrecy, and the White House allowed details of Obama's activities on the ground to be reported only after they were under way. In addition to talks with Afghan leaders, Obama planned to meet with Gen. Stanley McChrystal, the top U.S. military commander, and the U.S. ambassador to Afghanistan, Karl Eikenberry. He also was to speak with American troops. Obama was to be in the country for only a few hours before heading back to Washington. At least 945 members of the U.S. military had died in Afghanistan, Pakistan and Uzbekistan as a result of the U.S. invasion of Afghanistan in late 2001, according to an Associated Press count. Last month, a major offensive was launched to retake the Taliban stronghold of Marjah in Helmand province. The Marjah campaign routed most Taliban fighters from a town they once controlled, without a high casualty toll for U.S. troops and the Afghan security forces fighting alongside them. Military officials have praised the results, but cautiously. With fighting still raging across Afghanistan, and any successes still fragile and reversible, the war is not yet considered at a turning point. The key part of Obama's new strategy for Afghanistan — turning ordinary Afghans away from the Taliban by bringing in development and installing effective government — has barely begun. The next big military operation for the U.S. and NATO troops is being planned for Kandahar. The large city is the spiritual home of the Taliban insurgency. While it is not now under the Taliban flag, the insurgents are a constant presence. This year has brought potentially positive news for the war. Pakistan recently arrested Mullah Abdul Ghani Baradar — second in the Taliban only to Mullah Mohammed Omar — and other key members of the Afghan Taliban. Pakistan's government has not regularly taken on that group and has allowed it to have virtual safe haven within Pakistan. There also are doubts about whether the arrests represent Pakistan's desire to better help the U.S. or to further its own interests. Obama's talks with Karzai come as Washington's relationship with the Afghan leader has soured. Particularly since last year's flawed presidential elections, concerns about corruption and ineffectiveness in Karzai's central government have mounted. The U.S. and Western allies have demanded, with little success, broad reforms and proof that Karzai would — and could — shake off his ties to warlords and regional powerbrokers. One topic expected to come up was Karzai's plan for a three-day peace "jirga," or conference, in late April or early May. Looking a way to end the war, Karzai has invited Taliban participation.